Hello everyone, welcome. 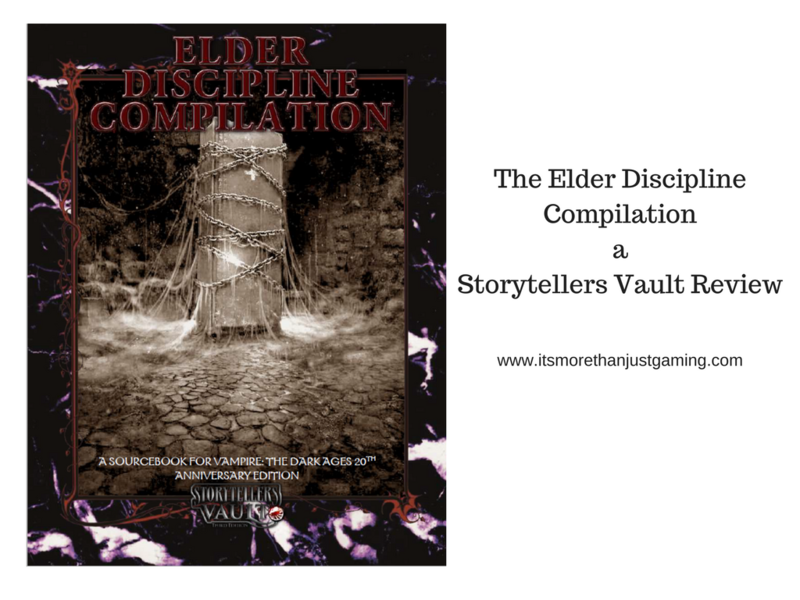 Today I am doing another review for the Storytellers Vault, this time for the book The Elder Discipline Compilation by Zack Ball. This is another book of community content created for World of Darkness Vampire: The Masquerade and Vampire: The Dark Ages. The Elder Discipline Compilation is approximately 40 pages of Vampiric Disciplines of level 6 and higher. I should say I was given free copy for review purpose. In Vampire:The Masquerade the cornerstone of vampiric power comes from their blood given disciplines, the supernatural superpowers that make them truly powerful. All vampires from the first to the 15th generation can learn disciplines from rank 1 to 5, and some can even learn techniques that combine discipline powers for truly awesome effects. You may remember a previous article I wrote about The Combination Discipline Compilation also by Zack Ball which covers a wide variety of these combined techniques. However, the powers don’t stop at level 5. Vampires of the 7th Generation or lower have access to powers of 6th level and higher. If you are unfamiliar with the game lore, Caine was the first vampire – cursed by God for being the first murderer. The vampires he created were the second generation (he created 3) and between the 3, they created 13 third generation vampires, the Antediluvian Vampires. Each Antediluvian is responsible for (at least) one blood line of vampires. Their offspring were the 4th Generation, and then the 5th and so on. The higher the number of generation, the less potent the blood. Vampires of 8th Generation or higher are restricted to discipline powers of level 1 to 5. This book deals with powers of 6th and higher, so it is for the Elder Vampires, basically. There isn’t an awful lot to say here actually, and don’t take that as a criticism. The layout looked good, though the text was occasionally blurry on my kindle when I read it, but nothing major (admittedly I don’t know if that was down to the PDF or the Kindle). And of course there were the powers themselves. I will list a few of my favourites below, with my impressions of them. The list is hardly exhaustive, obviously and there were plenty of others that I liked as well. I just wanted to share the best, in my opinion. Dark Domain – This potent Animalism Power allows the user to become utterly attuned to their territory, conferring such benefits as increased land speed whilst moving through it, increased dominion over the animals and an awareness of what passes/happens within their domain. I love this, not least of which because I want my character Mycroft to have it. I love the idea of a character with this playing a deadly game of hide and seek with an intruder, and I also like part of the description whereby the territory begins to resemble the user. A Dark Domain indeed. Spirit Sight – Users of this Auspex power have the ability to perceive other realms within the World of Darkness. So, they can see the Umbral Realm (spirit world), the Shadowands (the realm of the Dead) and even the Dreaming (Where the Fae come from). I think I like this more as an NPC thing than a player thing. I particularly like the idea of a Malkavian seer with this gift driven to new depths of Madness as a result of seeing the other worlds that mirror our own. Imagine looking down the high street of your town, but perceiving it without humans, with every building covered in webs and mechanical spiders scuttling over everything. What if you saw the real world superimposed on that image and saw the spiders doing stuff near some of the people. What if you then saw everything change? The Spiders and Webs were replaced by decay and the dead. Who are you going to tell? What are you going to say to them? I love that. Mysterious Traveler – This manifestation of the Discipline Obfuscate causes people to perceive the user differently. Rumours spread about the strange new traveler, some of which are true and others fiction. All that anyone knows is there is a new person in town, and there is something mysterious about them… I really like this. As a stealth power it is useful in certain situations, by spread of disinformation. It won’t hide you from the crowd in front of you, but it might make the crowd underestimate you. Or it may make them intrigued by you. I think as much as anything else, I like this simply because I think the storyteller can run wild with their tales and it would be fun for the player to hear what folks are saying about them. Cling/Spring Heel – These two powers come from the Potence Discipline, the discipline of Super Strength. Cling allows you to hold onto smooth surfaces simply with flesh contact, whilst Spring Heel allows leaping much greater distances. Years ago I had a character with Potence who liked high places and routinely leaped from building to building, and he would have loved these. There is a danger with powers like this your vampire nearly becomes Spider-Man or some other superhero. The flip side of that is, crawling along walls and ceilings is not the sole purview of arachnid based super heroes. Sometimes it is a manifestation of the demonic or the ghostly and there is scope here for doing just that. I think these powers would be fun to play, but also to put on an NPC antagonist and watch the players scratch their head as he drags himself up the wall of an alleyway and then leaps for the roof of a nearby building. That’d be fun. Delirium of Beauty – This high level Presence power overwhelms emotion as all Presence does to the point of invoking a state similar to Werewolf Delirium. (Werewolves in their war form cause Delirium which causes terror in mortals and then forgetfulness or rationalisation in all but the strongest willed). I just think this is a cool power. It turns out I had more to say than I thought. Imagine 40 more pages of stuff like that. Again, not much to say here. There were a couple of errors, which I have highlighted to Zack and won’t belabour here as they were minor. There were a few of the powers I was less keen on as, whilst they certainly were feasible, they felt game breaking. There were Auspex Powers that allowed users to learn abilities via telepathy, or oracular sight. Certainly feasible in high level vampires, but potentially too powerful. There were also a couple of powers that allowed for reversal of time, and whilst the Temporis discipline certainly has that power, I feel it should probably be represented as a story event done by an NPC rather than a dice roll activated power. (IE the Temporis Wielder has a contingency, that if certain things happen they rewind to a previous point but they can only do it so often as it is costly etc, but this happens as a triggered event rather than a power they can access anytime). Either way, that is only my take on this and am well aware that folks might have different opinions. There is a lot of good stuff in this book. More than a few of the abilities listed prompted story ideas for me, which was an added benefit. If you are looking for some additional truly horrifying powers for your NPCs to scare your players with, then The Elder Discipline Compilation is a worthy addition. The next part of this post contains an affiliate link to Elder Discipline Compilation. This means that if you click the link and purchase anything on your visit to the Storytellers Vault, I will receive a small commission that helps keep this website running. Cracking article. Very good review indeed.